Face-to-face communication is the most effective way to collaborate and bring ideas to life in your business. Because of this, many businesses invest heavily in travel budgets so they can meet in person to create and nurture business opportunities. However, video technology has become more accessible, affordable, and user-friendly over the years. In fact, the enterprise video business market will reach $36.5 billion by 2018. 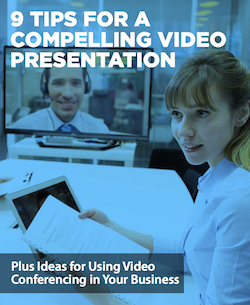 Download and read our guide 9 Tips for a Compelling Video Presentation for help on some great ideas to how you can use video conferencing to enhance your business success.